Even though we’ve got a good four months before the OnePlus 6 is official, the rumor mill shares information consistently for the device. The Chinese company has a unique branding for its smartphone, claiming that its gadgets are ‘flagship killers’. While this has not turned out true, as all the major flagships are still with us, OnePlus still manages to deliver excellent combinations of specifications and features, at an affordable price. Today, we’ve got more details for the upcoming OnePlus 6. Take a look below to find out more. If you are a regular reader, you will know that in order to classify a smartphone as flagship, we need to ensure it has a couple of critical specifications. 2017 expanded this list to include edge to edge displays and 10nm processors; as dual camera setups were already the norm a year back. 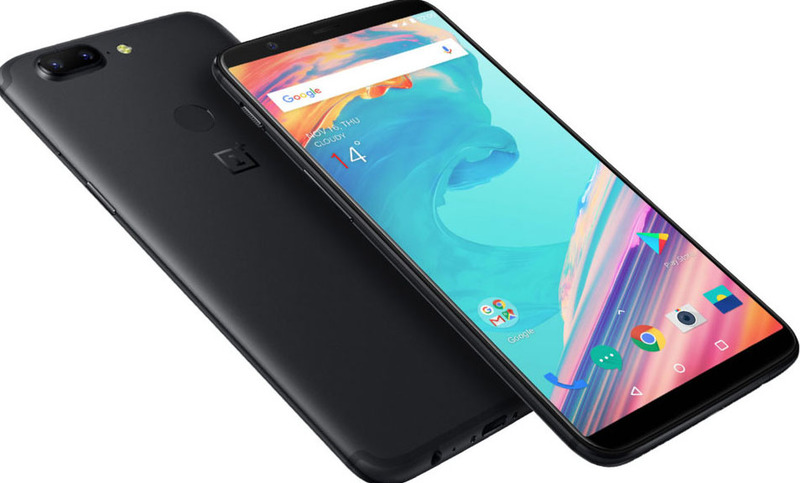 Now, today’s specification leak for the OnePlus 6 makes similar promises. Rumors for the smartphone over the past couple of months suggest that it will feature some impressive amounts of RAM and internal storage. A big disappointment for Samsung’s 2018 Galaxy S9 and Galaxy S9+ is their RAM. While the Korean tech giant can easily equip its smartphones with 8GB, it seems to believe that 6GB are sufficient. However, neither Xiaomi nor OnePlus harbor similar beliefs. Leaks for the former’s Mix 2s peg it with impressive Antutu scores, which are the courtesy of rumored 8GB RAM. And a recent leak for the OnePlus 6 also promises us a similar quantity; albeit with 256GB internal storage. Today’s leak however, deals with the 128GB variant of the device. 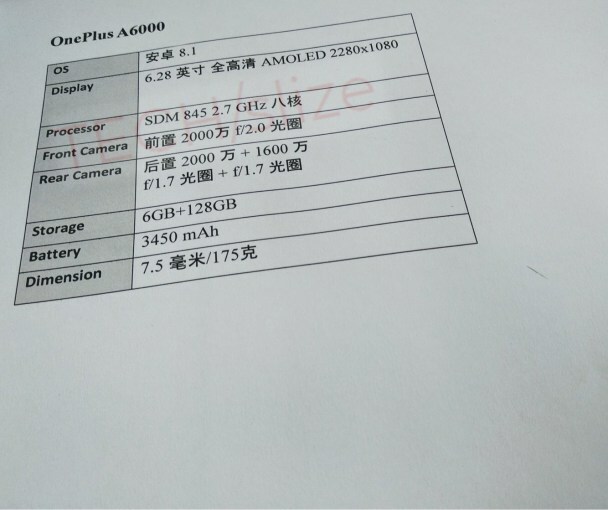 An alleged specifications sheet originating from China promises the Snapdragon 845, 6GB RAM and 128GB internal storage for the OnePlus 6 A600. It also promises a 20MP front camera with f/2.0 aperture width. At the back, we get a dual camera setup, with a 20MP + 16MP sensors. Both of these have f/1.7 apertures. Screen size for the smartphone stands at 6.28″ with a 2280×1080 resolution, making it slightly larger than the standard 18:9 aspect ratio. Battery capacity stands at 3450 mAh. In all likelihood, OnePlus will also resort to a notch for the smartphone’s front sensors, since an edge to edge display leaves little room to play with the elements. Of course, as the source of today’s information is not a regular, we suggest that you take it with a grain of salt. But, it does reverberate what we have seen previously on the rumor mill. Thoughts? Let us know what you think in the comments section below and stay tuned. We’ll keep you updated on the latest.